What are SentryOne Advisory Conditions? Being responsible for SQL Server performance and health can be a daunting task. As a DBA, you’re expected to be aware of everything that’s happening in your SQL Server environment at all times. But to do that, you need the right information at the right time. You need the ability to set up alerts that notify you when your environment experiences peak user traffic or when specific key SQL queries are running too slow. You need to know when one of the Windows servers shows high CPU usage. And wouldn’t it be great if you could set up and automatically fire off a database action—or a set of actions, such as a stored procedure—that can remedy the situation when a certain performance threshold condition is reached. You need actionable information—not a storm of alerts that are mostly noise, masking the real problem you need to solve. If you need a powerful, flexible solution for proactively monitoring your environment across a diverse range of situations, take a look at SentryOne Advisory Conditions. 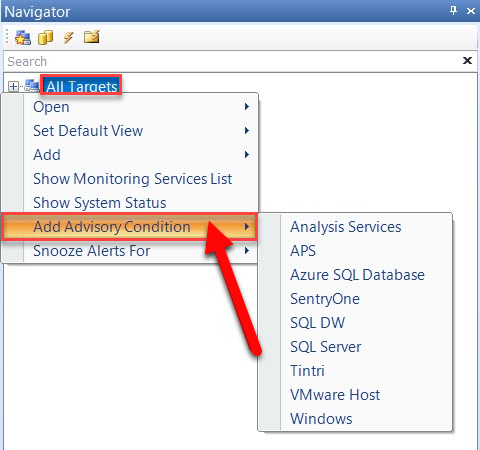 SentryOne Advisory Conditions can be configured for any SentryOne monitored target, including SQL Server, Azure SQL Database, SQL Server Analysis Services (SSAS), Windows, and VMware hosts. You can define SentryOne Advisory Conditions using logical operators. SentryOne Advisory Conditions form an advanced alerting and response system that allows you to truly customize the SentryOne Monitoring products to respond to any Windows, virtual machine (VM), or SQL Server database condition with complex logic based on performance counter thresholds, query results, and more. 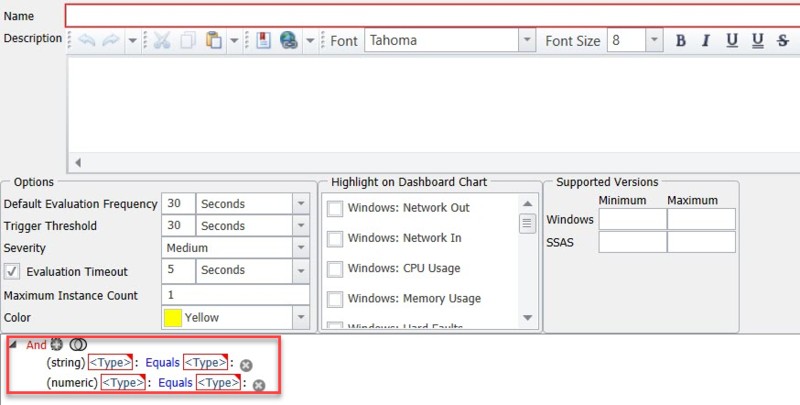 For example, Advisory Conditions allow you to collect and compare the results of a T-SQL query or WMI query. They also help you automate responses (actions), including sending notifications and executing commands on items specific to your environment and the applications that you support. The SentryOne Monitoring products ship with pre-built Advisory Conditions, which you can configure for your environment. Conditions can be set up at different levels of inheritance within your monitored environment. You can view the list of Advisory Conditions that are available to you, create a new condition, edit an existing condition, and view the condition events log, which gives you information when the condition was last evaluated for “True,” and more. Ready to start proactively managing database performance with Advisory Conditions? —Chris Taylor, Director, Jarrin Consultancy Ltd.